This showed up in my Inbox the other day – something Rodrick Owen says he stumbled upon in his home and was kind enough to photograph and send to me. 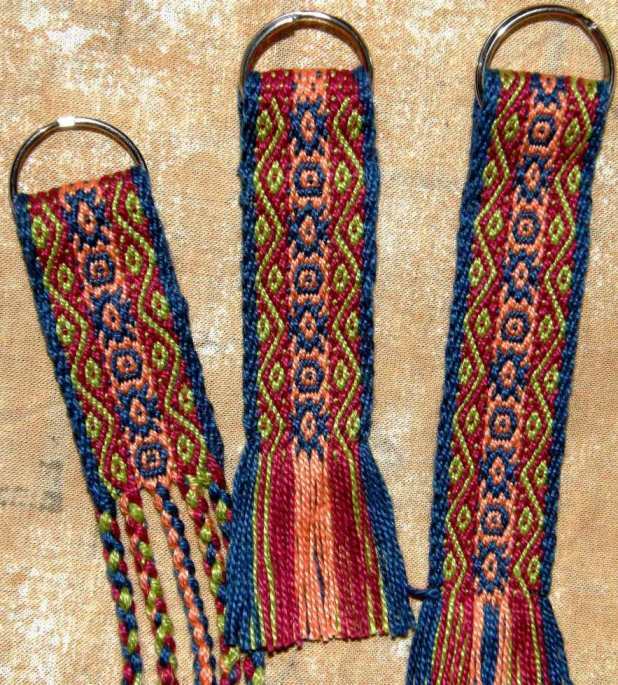 I can never see enough of these double-woven belts from Potosi and this one has some new designs to add to my collection – some horse motifs which I have not seen before and I can’t wait to chart that particular version of the floral design which appears on a lot of these belts. The floral design rolls along and then suddenly a dog appears. This weaver had a sense of humor! Its arrival is very timely as I decided this week to put the complete tutorial for one-weft double weave here on a new tutorial page on my blog. You can see it here and I hope you enjoy it. Another reason why I consider the appearance of the colorful Potosi belt well-timed, is that I have been thinking lately about being a bit more bold in my use of color in my weavings. At left you can see a four-color pebble weave sash that I made way back in 1997. It didn’t seem any problem for me back then to dive into the yarn bag, pull out some colors and whack them all together. Since then, there has been a drift toward the safe earthy colors – a splash of red here and there – but nothing too daring. Firstly I should point out that these yarns, which I bought in Guatemala in 2008, are all acrylic. It is hard not to get color crazy when you are in Guatemala. At first it is all a bit jarring but you get quickly used to it until you are completely addicted by the time you leave. You also quickly overcome any prejudices you may have had against acrylic. These yarns are used as supplementary wefts for decorating cotton ground weaves. Simple cotton for the ground weave warp and weft is sold at most markets in Guatemala. The most popular brand seems to be Mish, a local product. I love this ad for Mish painted on the crumbling shop wall. I wove some pieces when I got back from Guatemala with some of these yarns to consolidate the techniques I had learned there. Then the bag of yarn was put away and forgotten. Now I am going to respin and ply these acrylics – they are very fine – so that I can use them as warp and weave something bright and cheery. What I love is that they are made of natural fibers that have most likely been colored with natural dyes. Well, I have access to all the cochineal I could ever want here. Now I must get that instant indigo I was gifted and put it to work. At far left you can see my handspun llama fiber colored with cochineal with different mordants and coca leaves – quite dull next to the naturally dyed piece from Calcha on the right. A Weavolution companion has invited me to her home on my next visit to the US for a dyeing session in her studio. What an opportunity! I can’t wait to get my hands on some logwood. So, until I can learn how to turn out richer colors in my dyepot and respin all that acrylic, I will play with color using the cottons that I have available here in Santa Cruz. My first project is a zippered pouch for my belt shuttles. I have been a bit more adventurous here without getting too crazy. Ninety-nine percent of the time I weave a white or off-white motif on a base color. There is not one strand of white in this piece! This is the first part folded in half to show the size of the pouch and I probably have enough warp left to make another. 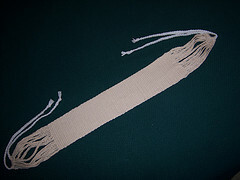 I plan to make a tubular woven band to edge it as I was taught in Potosi. 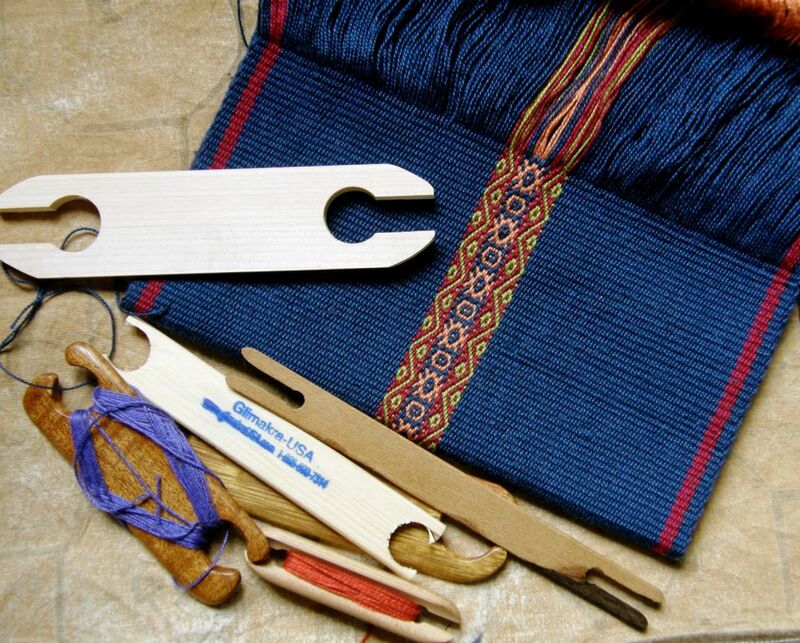 The tubular band I learned with my teacher Hilda is not as complex as the one shown on the blue Chincheros bag above. 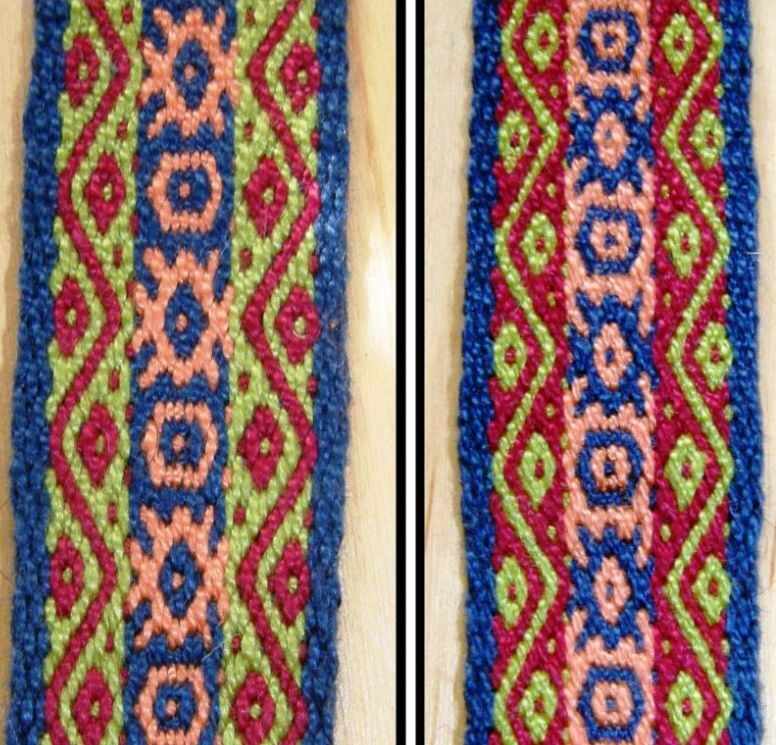 I first wove a sample band using three small motifs in Andean pebble weave and decided I liked the green motif on the red background and the orange one on blue. So I put that all together for my shuttle pouch. The samples got made into keyfobs. I was able to make three keyfobs from my sample band. The piece on the left, from Chichicastenango market in Guatemala, is made from richly colored cottons. The piece on the right is the one that I worked on in Santa Catarina Palopo and has acrylic supplementary wefts on a cotton ground weave. My teacher would quite literally put her hand into the yarn basket without looking and pick up just any ball of yarn to form the little motifs. After a while I would do the same, handing the balls to her to measure and cut according to the motif. 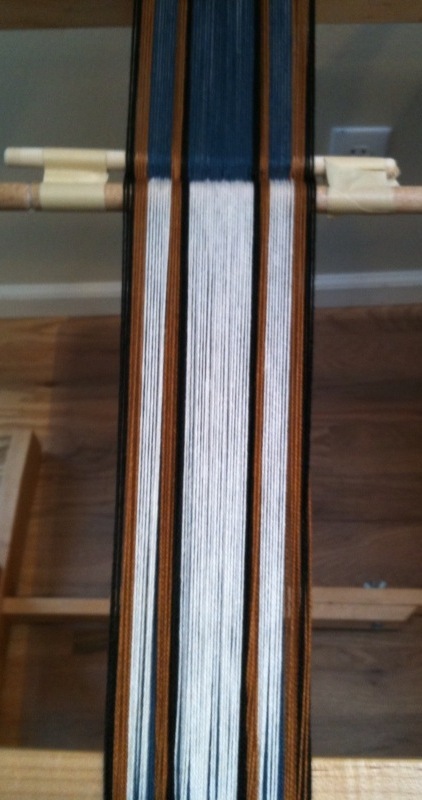 Carolyn aka Seaphish sent me this photo of her curled up warp of respun yarn when she took it off the loom and then at right you can see it "tamed' and on the loom with a nice Andean pebble weave band in progress. I am grateful to her for taking the picture as, when this has happened to me before, I have been far too perplexed to stop and take a photo! I will respin and ply all those acrylics on my drop spindle otherwise they will never stand up to being used as warp on my backstrap loom. I aways tell people in the online groups to be careful when using respun yarn when they are removing their warp from the warping stakes. The warp will spring to life and curl up on itself due to the overspin and, if you are not prepared with safety strings in place, you might end up with a disaster! One of the other things I have been working on is a test piece for the Coats Aunt Lydia’s number 10 mercerized crochet cotton. It seemed obvious to me right from the start that this was going to be a great yarn to work with. I had two balls, one of red and the other of white, and so I combined those colors with some of my black 8/2 mercerized cotton and am weaving a piece in Andean pebble weave technique on my backstrap loom. This is a longish warp and could be a tool bag for my longer cross sticks or a series of zippered coin purses for gifts. There you have all the information - down to the store name and price! Too fine a yarn for first-ever projects but something to build up to as you gain more experience. The inklette has been christened! 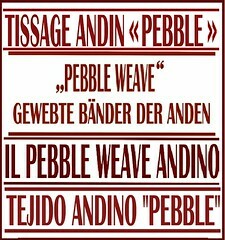 I am still pondering ways to perhaps use the inkle loom’s shedding sytem for Andean pebble weave but I have not found an efficient way yet to do this for any but the very narrowest of bands. For me, the best way is to simply use the loom as a frame on which to place your warp and set it up as shown in my e-monograph. I am inclined to think that nylon heddles may be better when using the inkle loom in this manner. I found myself last night sitting on the foor with one foot anchoring the tiny inklette as I pulled up on the pebble sheds. Not a problem as I spend a great deal of time on the floor. However, I decided today to try it out in a slightly more civilized fashion by clamping it to the breakfast counter. Look at my tiny shuttle - how cute is that! I have gone back to muted tones on this band I am afraid. According to the leaflet I have a 72" warp on this so I think I'll be getting a new belt with enough leftover for something else. I am using a fairly relaxed tension on this which makes opening the sheds easier and stops the motifs from appearing stretched out. So, we have been weaving along with pebble weave at Weavolution using my e-monograph. 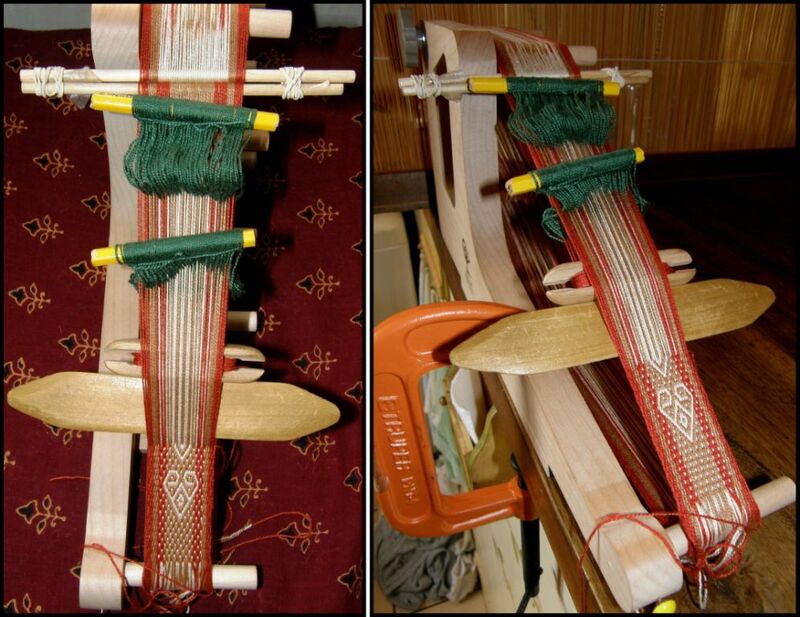 Different people are at different stages…some are warping, some are making their string heddles while others have started weaving. I think that some are still in the process of choosing their designs and planning their piece. At left you can see Jennifer’s choice of warp colors. I showed you one of Jennifer’s bands last week. Now she is venturing on to a wider piece. She wasn’t sure if the colors were suited to a pre-Columbian bird motif. 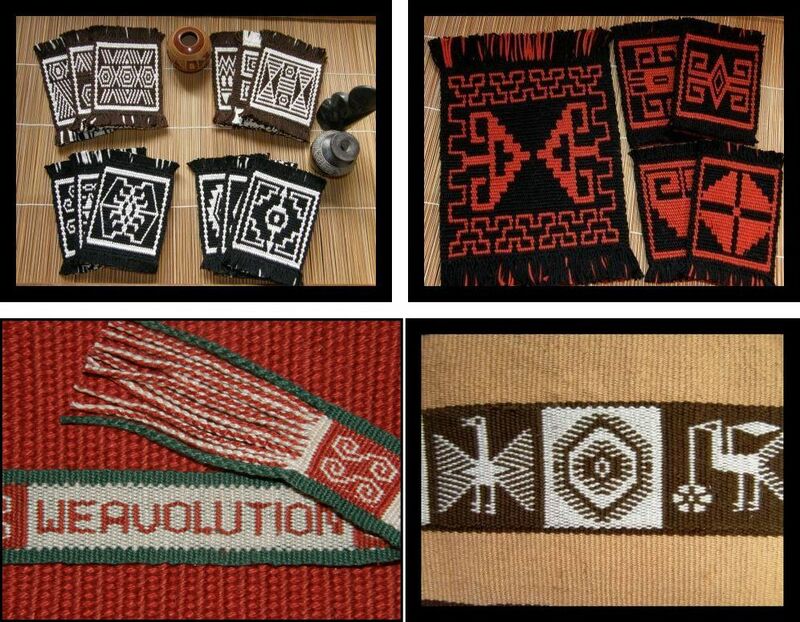 A lot of pre-Columbian cotton pieces were woven in either natural brown and white or white and indigo. Her warp looks beautifully made…nice and even. Wind a good warp and everything else, such as making string heddles and opening your sheds, will be that much easier. 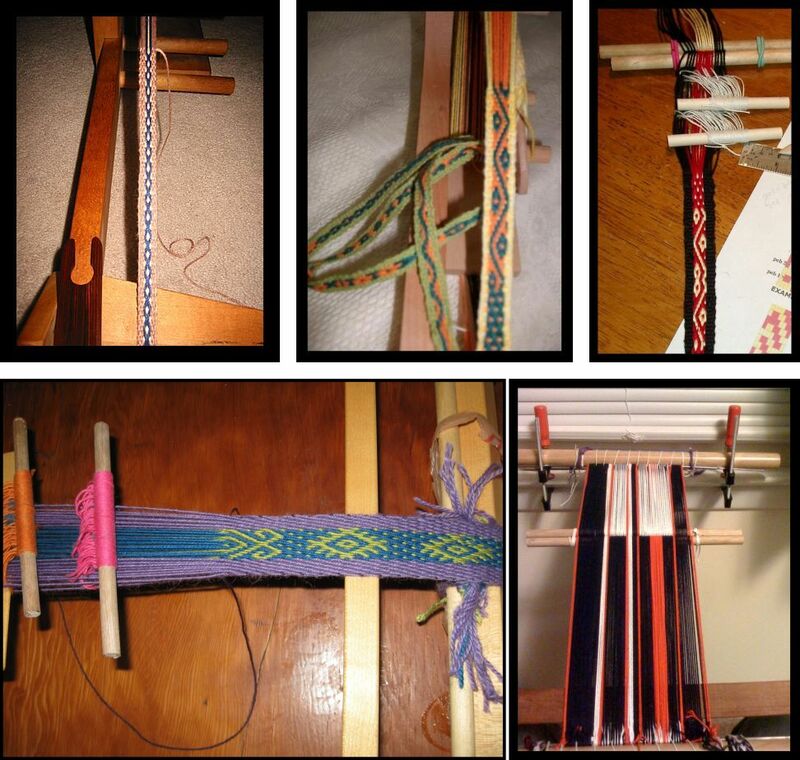 From left to right...Tony's and Caroline's first bands on inkle looms, Jeanne's backstrap piece, Carolyn's band on the frame of her rigid heddle loom and Virag's warp set up for backstrap weaving. Keyfobs and hatbands look good even in heavy yarns. Bookmarks are better suited to fine ones. Wider warps with or without pick-up designs can be made into small zip purses for business cards, credit cards, coins and cosmetics. Going wider, you can make small bags for a passport, iphone or other gadget. What was originally intended as a cellphone pouch was turned into a cigarette pack holder. Long but narrow warps make nice belts. Finally, here are my two current small projects. Going wide does not necessarily mean more pick-up. A narrow strip of pick-up can be placed on solid color. The piece at left is weaving up really fast. I am putting together some video pieces for next week’s post to show you all how to open the sheds on your backstrap looms smoothly and efficiently. This is one problem I noticed when I visited and wove with some people on my recent trip to the US. Opening the sheds becomes a real struggle when you have a lot of pilling on the heddles. Sometimes it is a matter of a less-than- ideal yarn choice but usually the problem is caused by sliding the heddles around too much when attempting to open them. So, I will have those videos for you next week and NOT just on the dream warp with the perfect yarn! I will show you how to deal with some of those sticky warps as well as wide ones with fine yarns. 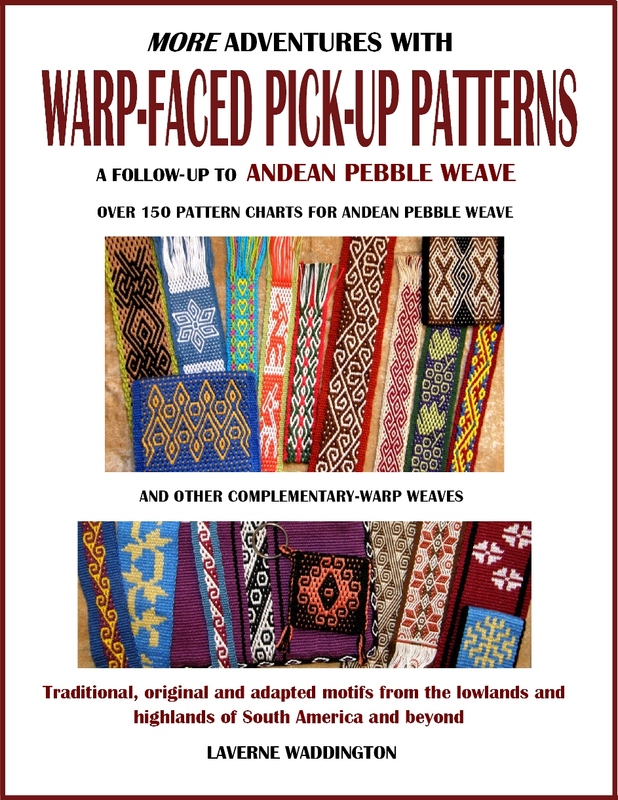 Included will be tips for working with two heddles for Andean pebble weave. I put some photos together to answer a question on the Yahoo group, about using stretchers or tenter sticks on wide warps to help maintain an even width and I thought that I would share them here as well. I don’t use them as I have not woven anything wider than a table runner but I have used them with my teachers in Guatemala and coastal Ecuador. 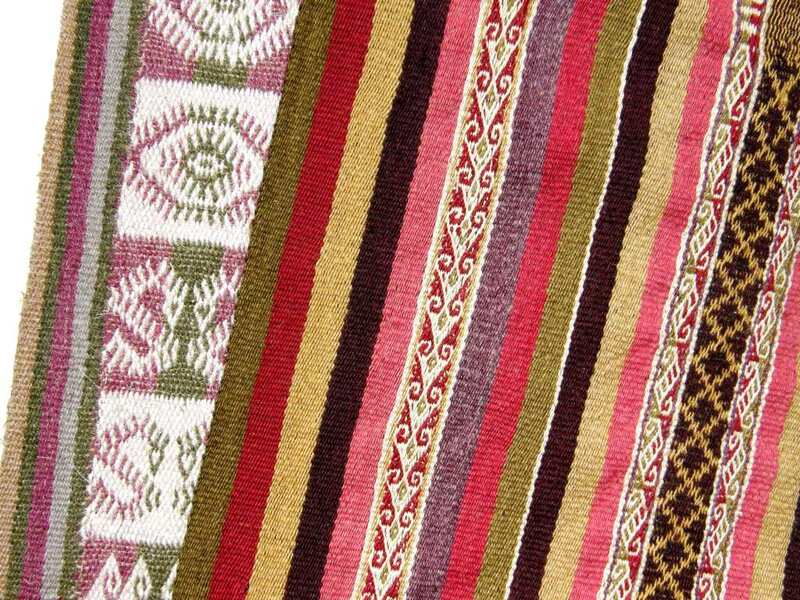 You can see the upper surface of this Guatemalan weaving at left. The stretcher bar is a hollow piece of bamboo which sits under the weaving just below the weaving line. All those threads hanging out are the ends of the supplementary wefts which may be snipped off when the piece is finished. The stretcher bar is moved up every few inches. A small nail pierces the upper surface of the weaving just below the weaving line and three or four warps in from both edges. The nails are then turned and inserted in the ends of the bamboo. This weaver in coastal Ecuador uses a bamboo slat to help maintain an even width for her weaving. It sits on the front side of the textile. Her tenter stick is a bamboo slat made by breaking open a tube of giant bamboo. Weavers will have a collection of these sticks for the various widths that they usually weave. The ends are whittled down to points which pierce the edges of the weaving. I wove on this piece and it was a real struggle removing, moving and replacing the tenter stick, which is held very tightly in its position, as the weaving progressed. The stick doubles as a spacer when the weavers are making their string heddles. These are the cotton saddle bag weavers I spent time with on a research trip with anthropologist Kathleen Klumpp in 2007. 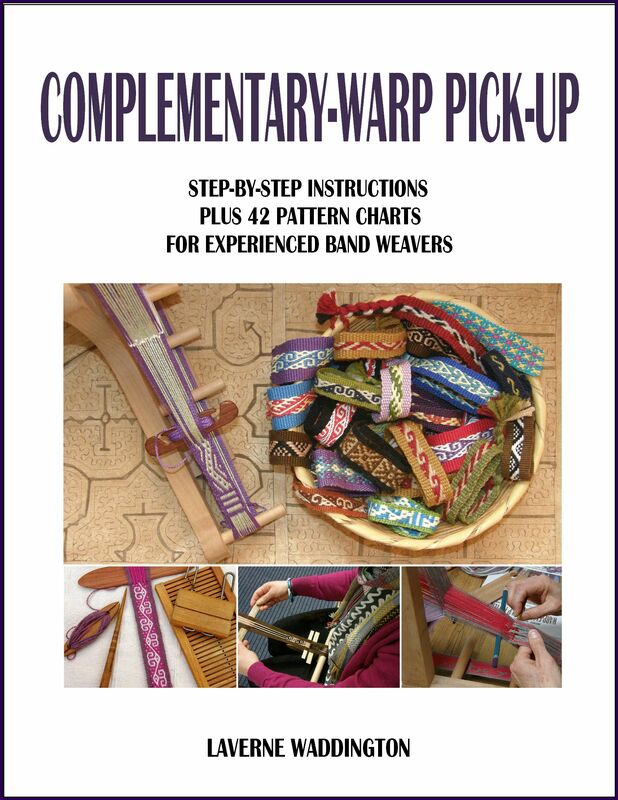 Come and join the Weave Along at Weavolution , or enjoy the tutorial on one-weft double weave here. Don’t forget to send me pictures of your projects! Cookie has allowed me to show you a photo of her first ever backstrap weaving project – here is her woven cotton backstrap. 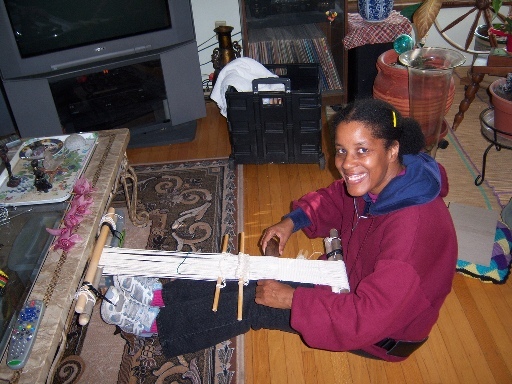 And here is my favorite – possibly the coolest backstrap photo I have ever been sent as so few people have photos taken of themselves at the loom. I love how she has the remote control in the photo as that is one of my essential weaving “tools” too! This is an excellent set up. Her far loom bar is completely stable tied like that and, as she progresses, her legs will just slide under the table. I envy her being able to sit on the wooden floor like that! Thanks for the pictures, Cookie! I’d love to buy your book and will order it if it’s okay to make myself a hard copy from the PDF, for myself only. I’m not sure about the copyright issues here. I guess if I have your permission, that’s probably override any objections anyway? Hi Pamela . You have my permission to make a hard copy for your own personal use. I hope you enjoy it! The rich blue piece with the multi-colored patterned band is very rich. To me it sings a happier song than the red, white and black piece. I also like the lesson- just put your hand into the basket and use the color that you find. Sometimes we over-worry or over-intellectualize our color choices. I use a lot of crochet cotton for warp faced weaves, including the varigated ones. And altho’ I love some of the colors of the acrylic yarns I haven’t been able to bring myself to weave with them. I’m going to try the cotton embroidery floss for the brightly colored brocading yarns in the next project. The blue bag is beautiful. I laughed out loud when I read your comment about going color-crazy in Guatemala! Glad to see you playing with colors. This adds another dimension to interesting patterns. Hi Laverne, lots of lovely photos and ideas here – yet again. I do hope you will someday get a publication in book form, I’m interested in your work on pebble weave but I don’t enjoy reading off screen, when I stop work for the day I love turning the computer off! i think it is a funny coincidence, but I was doing a weaving class last week in Huancayo and looked up on the net some weaving patterns and got guided to your website. Today I was reading on your site again and realised I think had the same teachers as you did, margareta and her daughter Mercedes! I´m working on a backstrap band. Now without them….We are on (slowly) our way to Bolivia, Santa Cruz wasn´t on our planned route, but I was thinking it would be awesome to meet you. Would you give me classes for a few days? Could it be the same Margarita?? That would be amazing. She taught me in 1996! Come to Santa Cruz! !-I will give you some classes. 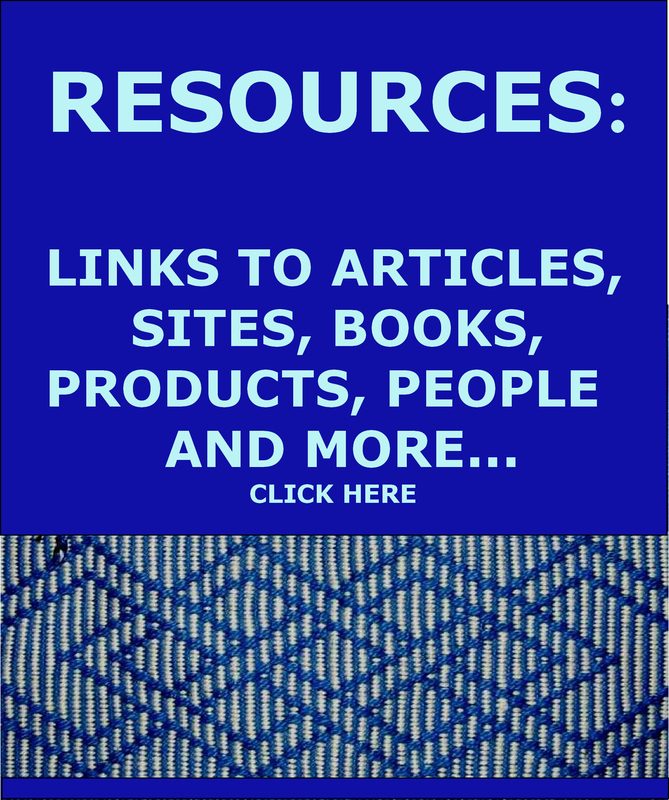 The article on WeaveZine will help you a lot as it ihas videos. 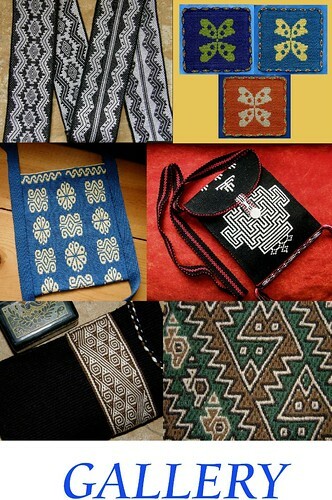 Stary off with a single color and plain weaving and slowly build your skills. I will email you. 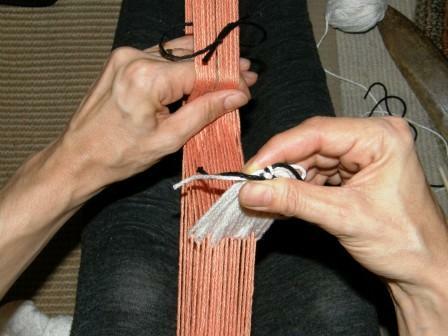 This week I hope to do a tutorial on some basic weaving. You have a beautifull site ! I’am living in Belgium, and don’t speak english.. 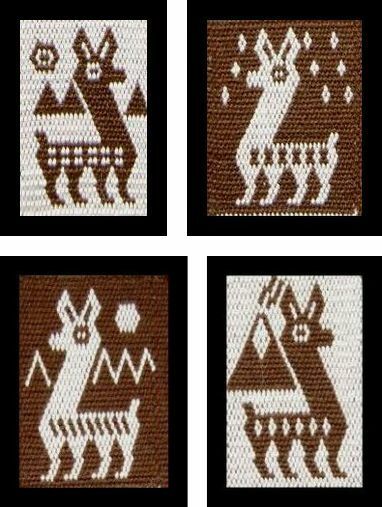 I want to try the pattern with the lama, where can I find the pattern , please ? Hi..! I came across your site doing some research and I love it!! 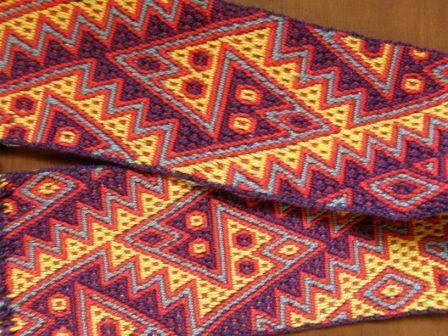 I have purchased a framed woven scarf and would like to send you a picture of it..I think it might be Guatemalan, but not sure…I posted the pictures on facebook if you would like to take a peek…Thank you for your time..